(Final Mile, Behavior Architects) In Mumbai, a warning sign that's hard to ignore. The suburban rail system in the Indian megalopolis of Mumbai is best visualized as two slim arteries cutting through a crowded peninsula. On a map, the Western Line runs due north; the Central Line begins similarly, then wanders away into the city’s northeastern parts. These two lines and a couple of adjunct capillaries, making up a rail network dating back to 1857, carry roughly 7 million commuters a day, some of them over distances as long as 75 miles. Every mile of this network runs through dense pockets of population, houses, and buildings; these are often just yards away from the tracks, separated at best by a low wall. Sixty percent of the length of the Central Line, for instance, has slums on either side. At rush hour, trains barrel through every couple of minutes, and pedestrian bridges over the tracks are rare. As a consequence, the most popular way for pedestrians to get between east and west Mumbai is to dash illegally over unguarded sections of the tracks. The consequences are often fatal. On average, 10 people die daily by being hit as they’re crossing the tracks. 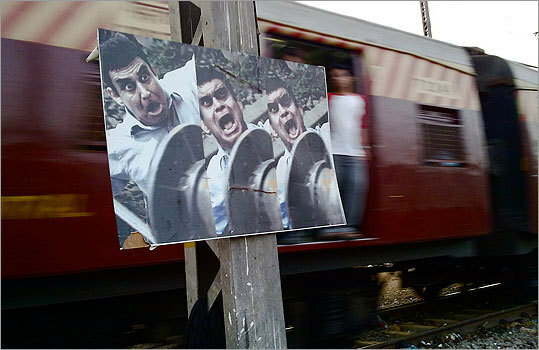 Track trespassing is the largest everyday cause of unnatural deaths in Mumbai. For just over a year, however, an experiment at Wadala station, on the Harbour Line, has been hinting at unorthodox solutions to this problem. On the surface, the experiment involves small, odd changes. Certain railway ties have been painted bright yellow; a new kind of signboard has been installed near the tracks; engine drivers have modified the way they hoot their warning whistles. This modest tinkering has had dramatic results. In the six months before the experiment went live in December 2009, Wadala had recorded 23 track-crossing deaths, said M. C. Chauhan, a manager with the Central Railway’s Mumbai division. Between January and June 2010, that number had dropped to nine; in the next eight months, up until February 2011, only one death was registered. “We think the project is a huge success,” Chauhan said. The experiment is a pro bono safety project conceived by a Mumbai-based “behavior architecture” consultancy named Final Mile, which uses the lessons of cognitive psychology to influence people on the brink of making decisions. Classical economics has long held that human beings are largely rational, even as a century’s worth of psychological study has suggested otherwise. Advertisers and marketers have crafted campaigns on the premise of the rational being, believing that, say, a detergent brand need only insist on how much cleaner it can clean. But recent studies in behavioral economics and cognitive neuroscience have emphasized that human decisions are fraught with irrationality — that a detergent buyer may be more influenced by the shape of the container, or where it is stocked in the store. These precepts about how to sway people have begun to filter into crowd-control situations, financial education programs, and even the apparatus of government. But these tactics can also be repurposed to save lives. The Mumbai experiment provides a concrete new example of how seemingly abstract principles of irrational decision-making can, quite literally, steer human beings to safety. In the past, safety campaigns, appealing to our rational minds through such measures as cautionary signs printed with text, have stumbled on a cognitive hurdle. The conscious human mind has evolved to latch first on to new information, and while this enables us to process the world around us more swiftly, it also means that familiarity breeds inattention. A sign printed “Caution,” then, has far less impact the 10th time we see it. But behavioral theorists place more faith in the subconscious mind, which is an indiscriminating filter of all input, whether old or new. To walk around the Wadala experiment is to understand the surprising effectiveness of simple appeals to the human mind’s irrationality. Before the experiment began, the few exhortations to trespassers consisted of warning signs with lengthy text and stick-figure diagrams. These had proved tragically inadequate, so Final Mile designed three specific “interventions,” each intended to tackle a particular cognitive problem. Second, the consultants replaced the stick-figure signboards with a graphic three-part tableau, featuring in extreme close-up the horror-struck face of a man being plowed down by a locomotive. “We hired an actor,” Krishnamurthy said, smiling, “because it had to be realistic.” They were drawing on the research of Joseph LeDoux, a New York University professor of neuroscience and psychology. LeDoux studies the links between emotion and memory, and in particular the mechanism of fear. “Emotional memory is stored in the nonconscious part of your brain,” Dominic said. “If you’ve been in a car crash and, months later, you hear tires squealing, your heart rate goes up and you start to sweat. That’s because your emotional memory has been stirred up.” The new signs dispense with explanatory text and instead attempt to trigger an emotional memory of fear. These simple, inexpensive interventions have worked so well that they’re now being extended across the length of the Central Line. But the larger implications of the experiment stretch beyond Mumbai, and beyond track-crossing deaths as well. India is not the only country with a track safety problem. The very nature of railroads — tracks stretching many hundreds of miles, often into rural territory — has meant that the trespassing problem is difficult to solve. In the United States, the number of pedestrians who were fatally hit by trains rose 8 percent from 2009 to 2010, according to the Federal Railroad Administration Office of Safety Analysis. California, Florida, and Illinois rank at the top of the fatality data set; the Massachusetts Bay Transportation Authority, by comparison, fares well. In California in 2010, 66 people died after being hit by trains; the MBTA’s corresponding figure is only 2. Outside of transit, health and safety officials have similarly explored communication methods that appeal to the subconscious. A three-year study in Europe examined how nutrition labels could be more effective by targeting subconscious perception. Canadian cigarette packs now carry graphic images of blackened lungs, instead of a cartoonish skull-and-crossbones. Samanth Subramanian is the Indian correspondent for The National. His first book, a collection of reported essays titled ”Following Fish: Travels around the Indian Coast,” was published by Penguin Books in May 2010. Correction: Because of a reporting error, an earlier version of this article about railway signs in Mumbai misidentified the rail line that Wadala station lies on. It is on the Harbour Line.